Ohh I thought you were talking about the top of my desk which needs a whole bunch of organization help (going to have a post on that? ha). As for my desktop, I think I’m OK, it’s not too cluttered but I could definitely get rid of some of it and add more to make things faster to access. 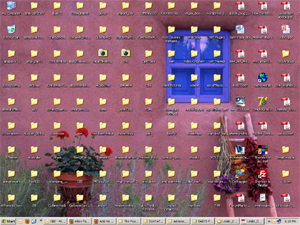 Omigoodness, am I ever guilty of desktop clutter! It’s so bad, in fact, that every summer, before we go back home to visit the folks, I madly try to get it at least a little cleaned up – because my mom and my dad are always giving me grief over it! LOL!! And I have the same types of things on there that you do. My ‘my docs’ folder gets so crazy that if I d’load a new pdf that I really don’t want to lose track of, I’ll stick it on the desktop, because, I’m going to read it in ‘just a little while’. Yeah, right. Heh. Angie, I envy you for having a handle on your desktop. Hopefully will do better now that I am intentionally trying.